This silly thing has been in the works for 3 years. I had initially planned this space to house the bulk of my medicinal herbs. For whatever reason, it never truly worked out. I ended up with a ton of weeds, or a series of higher priority projects. It seems that this may be the year for my medicinals! There’s a decent foundation of grass clippings, leaf mold, and newspaper. To that, yesterday we covered with 3 year old composted wood chips. My hope is that I’ll be able to grow hyssop, bee balm, German chammomile, lemon balm, and a few other things there. It gets great sun, and is near the front door for easy access. Not only that, but my hope is that it’s a charming focal point in the front yard. I’m going to add a rock border and I have a neat little planter to put in the center with some calendula. Our place has lacked that homey curb appeal for a while. I’m hoping to improve upon that this year; make it more like a home than a house, you know what I mean? It needs flowers! And beautiful things. And I’d love some rocking chairs for the front porch. Perhaps once we finish this debt snowball, we can acquire some outdoor furniture. 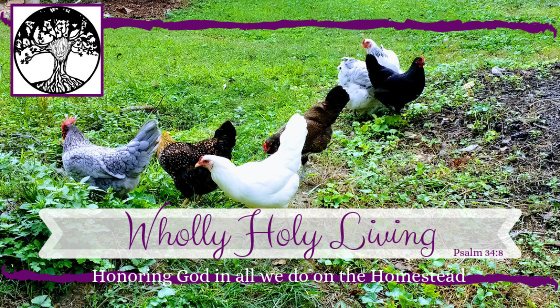 There is never a shortage of have-tos and want-tos on the ole homestead, that is for certain! Keep plugging away at that debt…you’ll be so glad you made that a priority!